MickeyTravels is excited about our new initiative – The MickeyTravels Agent Virtual Meet & Greet. We will feature a different MickeyTravels agent on a daily basis. We’re proud to have the best Disney Travel agents in the world as part of our MickeyTravels team and this will allow you to get to know them even better. Today the spotlight shines on Donna Rossi from Pennsylvania! Where are you from? I live in Ardmore, Pennsylvania – a suburb of Philadelphia. I grew up in the nearby town of Broomall, PA.
First memory of Disney? 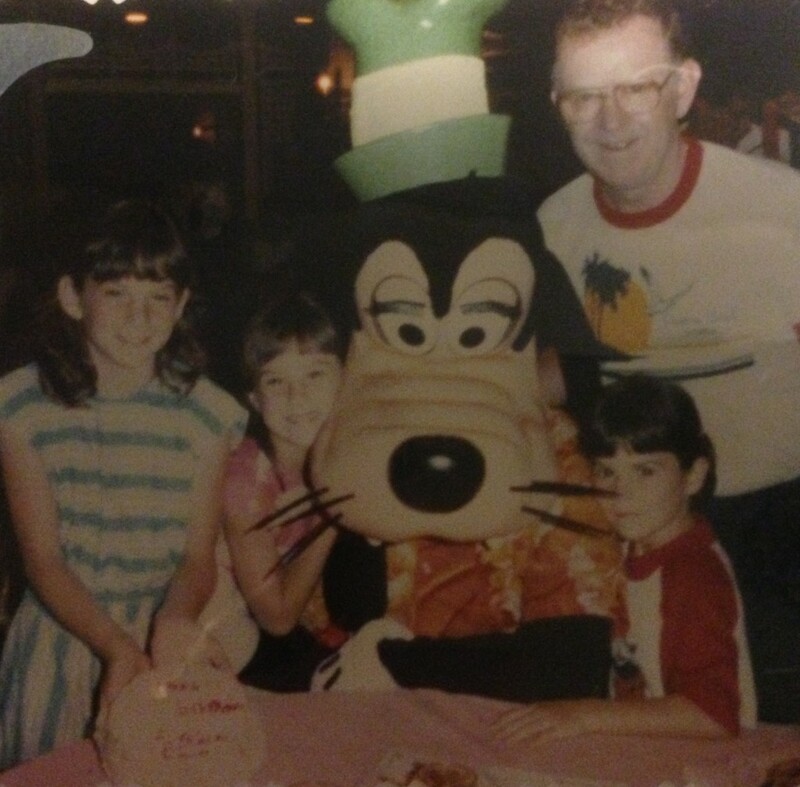 My first trip to a Disney Park was a family trip to Walt Disney World when I was 8 years old. I remember seeing the Castle, a feeling of amazement walking down Main Street USA, and the Monorail! What makes Disney MAGICAL in your eyes? 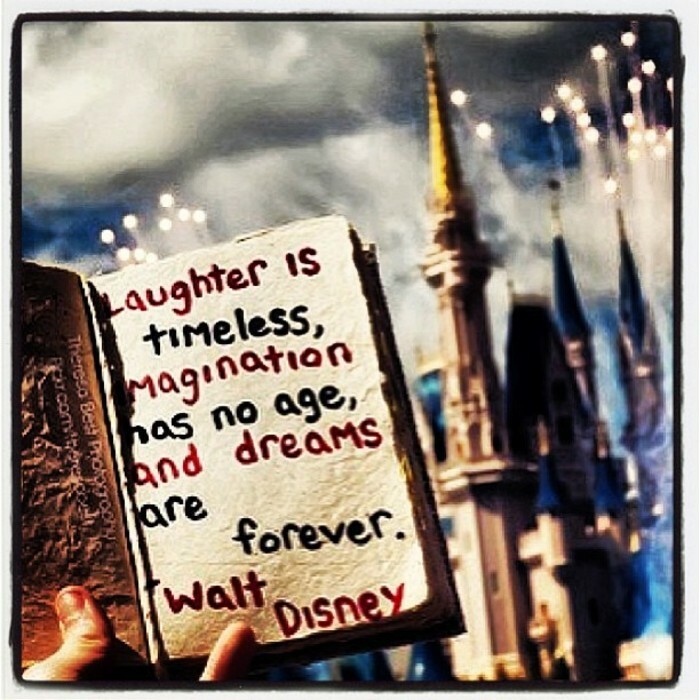 I believe the Magic of Disney is in the storytelling. There is storytelling all around and the subtle details that support these stories are amazing! Think of waiting in line for a Disney attraction, walking into a gift shop and looking above the merchandise at the wall decor, or how the background music will change seamlessly when you move from one part of a park to another. The resorts also work their own Magic with storytelling, giving every resort a unique look and feel. With Disney no detail is forgotten and everything tells a story – and that is MAGICAL! Favorite Disney destination and why? It is difficult to select just one Disney destination, mostly because I’ve never had a bad vacation when it was a Disney one… but I think my favorite would be Disney Cruise Line. Unlike the theme parks, when sailing on a Disney ship you can experience all the terrific elements of a Disney vacation while enjoying unparalleled convenience and service. This is particularly true when traveling with small children. Your room is always a few steps for naptime (kids or adults! ), and the kid’s clubs are outstanding. No worries about being too hot, waiting in long lines, or generally wearing yourselves out. Practically everything is included when you sail, there are seemingly endless activities and leisure opportunities, plus you have more chances enjoy food and drink than you can imagine! I’m ready to set sail again! Favorite Disney Character and why? My favorite Disney character is good old Mickey Mouse because he is always so warm, friendly, and welcoming. Favorite Disney Attraction and why? My favorite Disney attraction hands down is Tower of Terror in Disney’s Hollywood Studios or California Adventure. This attraction has it all – amazing theming, thrilling drops, and it is comfortable (scary, yes; hard on the body, no). I love that they randomize the drops so it’s never know how your trip to the Twilight Zone will go! Favorite Disney Resort and why? There are no bad Disney resorts, but if I had to pick just one it would be Disney’s Contemporary because the location to the Magic Kingdom just can’t be beat. An easy Monorail ride, or even easier 10-minute walk, makes the Contemporary a super convenient resort to stay when traveling with small children (or adults who also can’t get enjoy of the Magic Kingdom!). The views are stunning – a Theme Park view where Cinderella Castle greets you each time you look out on your balcony, or the Bay Lake View where you can enjoy the nighttime Lagoon Show while your children sleep. I also appreciate the day bed giving the rooms at Disney’s Contemporary Resort a good fit for a family of 5. Favorite Disney Restaurant and why? 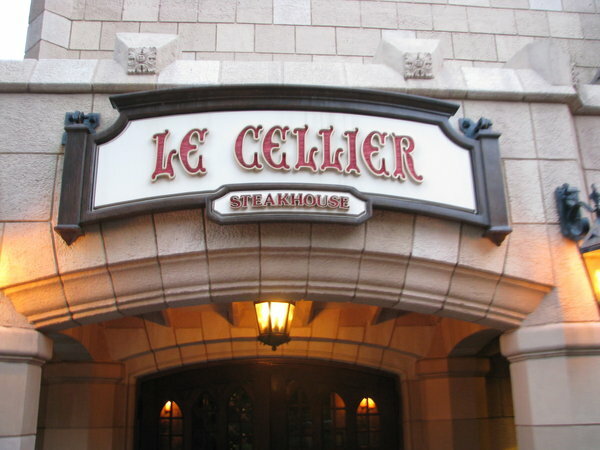 LeCellier in Epcot’s Canadian Pavilion earns my vote for favorite restaurant, followed very closely by Disneyland’s Blue Bayou, which is set inside the original Pirates of the Caribbean attraction. Both have outstanding food, service, and fantastic theming! Favorite Disney Quick Service Restaurant and why? Lunch at Be Our Guest Restaurant inside the Beast’s castle in the Magic Kingdom has become my favorite Quick Service spot because it’s gorgeous inside (and it’s snowing! ), plus the desserts are incredible. Close to my heart is Sleep Hollow, also in the Magic Kingdom, for their delicious waffle sandwiches! Favorite Disney snack and why? Oh, Dole Whip pineapple soft-serve ice cream… I think it’s what happiness tastes like! Favorite Disney Movie and why? 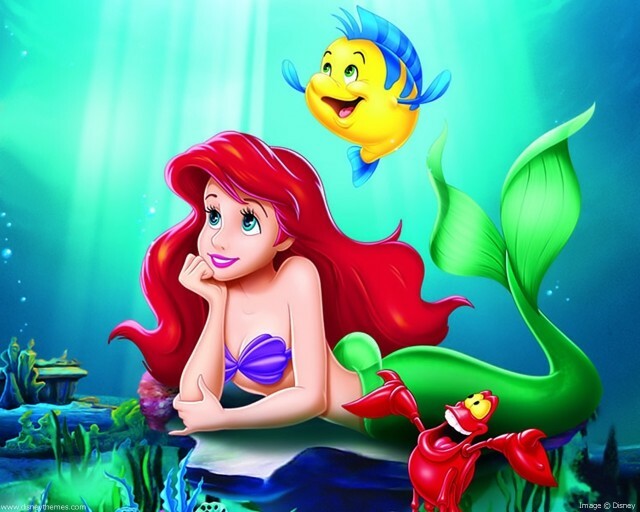 I adore so many of Disney’s movies, particularly the animated ones, but my very favorite is The Little Mermaid. I purchased it when I was a young teenager and it drew me more into Disney than you would think a cartoon could to a kid in late middle school. The music, story, and characters were a delight to experience over and over again. The movies that followed (Aladdin, Beauty and the Beast, The Lion King) proved that The Little Mermaid ushered in the second Golden Age of Disney Animation. 3 Favorite Disney Song and why? It’s tough to select just three Disney songs as my favorite, but here goes: the soundtrack to “Fantasmic!”, “King of New York” from Newsies, “There’s a Great Big Beautiful Tomorrow” from Walt Disney’s Carousel of Progress. I chose the music from Fantasmic because it gives me goose bumps each time I hear it – such energy and life that you can’t help but be excited just listening to it (and all the better when you are watching the show!). The Newsies song “King of New York” makes the list because it’s a great example of what a musical number should be: catchy, clever, and moves the story along while entertaining the audience. Finally, the Sherman brothers tribute to the very spirit Walt Disney himself embodied – the eternal optimism that things will get better when people work together and are given the freedom to put ideas into action. Disney character you’re most similar to and why? Belle from Beauty and the Beast would be the character I feel most similar to because she is independent, optimistic, friendly without being a push over, and loves to read. Plus we both have brown hair. If you could be one Disney mascot for a day who would it be and why? 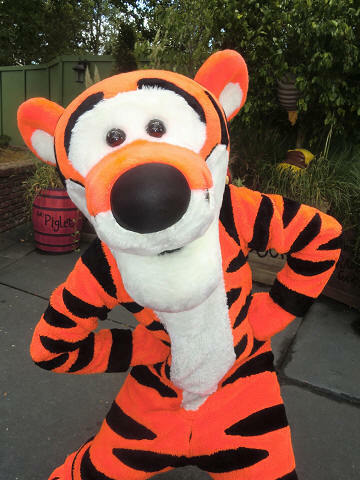 I would love to be Tigger for one day because of his wonderful energy and sense of pure joy with his every bounce! If you could work at one of the Disney theme parks, what job would you want and why? The job I would pick for myself if I were to work in one of the Disney theme parks would be to care for the ducks that live in the Castle moat and waterways in the Magic Kingdom. If reincarnation happens, I want to come back as a Disney duck! Best part about being a MickeyTravels Disney Travel Agent? The best part of being a MickeyTravels Disney Travel Agent is being a part of family that’s filled with people who want nothing more than to give others the very best experience possible during their Disney vacations. I knew I’d love helping families plan their Disney vacations because that’s so much fun (I’ve been doing it for my friends and family for years before I knew it was an actual job). What I didn’t expect was to find a group of dedicated, passionate, and highly collaborative agents who want to help each other make every single client’s experience Magical. There is something very special and all together wonderful about working with people who all want everyone else to succeed in a goal – and that goal is to do our very best for each and every client. Why should I book my vacation with you? You should book your vacation with me because I love helping people get the most out of their Disney vacations. I want you to get the best value for your money, have the most magical experience while on vacation, and think back to the planning process and feel like it was a breeze. When you book with me or any other MickeyTravels agent you get outstanding customer service, a dedicated individual who will help you with every step of the planning process, and someone who is always looking for ways to make your vacation the best it can be. These services are free to you, so it’s a “win” all around! Every little princess must have a Fairy Godmother, am I right? Well, when you arrive at the Bibbidy Bobbidy Boutique that is exactly who is waiting for you…your daughter’s very own Fairy Godmother. Let me tell you, she will be ready to put her magic wand and pixie dust to use, transforming your little girl into a radiant princess (simply making into a reality what we she already knows to be true- that she IS a princess). This one of a kind experience is truly one you will want to make sure you make time for. The Fairy Godmothers are amazing, funny, sweet and all around adorable! Your little princess will be on cloud 9 as she is given the royal treatment. Cinderella herself even gets ready for her busy day right there, in the Boutique. On our last trip, my youngest princess even had her makeover in the same chair, that Cinderella was in, that very same morning. Upon arriving, you will choose which Royal Package you would like for your princess to receive. Castle Package: Includes the Crown Package plus the Imaging Package (One 6×8” and Four 4×6” photos in a princess themed photo holder and complete costume of your choice with accessories. Once you have selected your package you will be called back shortly, to meet your very own Fairy Godmother and she will begin her magic. A photographer is right there making sure to get those precious shots of your little one’s transformation. Be sure to keep the tissues handy, you (and your husband) are sure to shed a tear or two as your daughter is doted upon and loving her makeover. 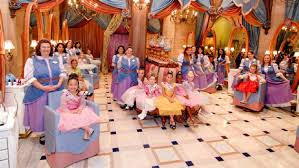 Part of the magic, with this experience, is that the little girls are facing away from the mirror the entire time. It isn’t until the Fairy Godmother is satisfied with her work that she will grab her magic wand (full of pixie dust) and sprinkle it over your daughter’s head, saying the magic words: “Bibbidy Bobbidy. Bibbidy Bobbidy. Bibbidy Bobbidy. Boo!” At that moment she will turn the chair around and your little belle of the ball is able to see herself for the first time. It is in that moment that you’ll need the tissues, for dad’s “allergies”, of course! It is truly very special. For the rest of the day, your princess, will enjoy her reign and walk with an extra glide in her step (she may even throw a curtsy in there as well). The reservations open up 180 days in advance. So, pre planning is key. If you would like for me to help you turn this experience into a reality for the Princess(es) in your castle, I am more than happy to do so! Planning your perfectly magical Disney vacation is my joy and privilege. 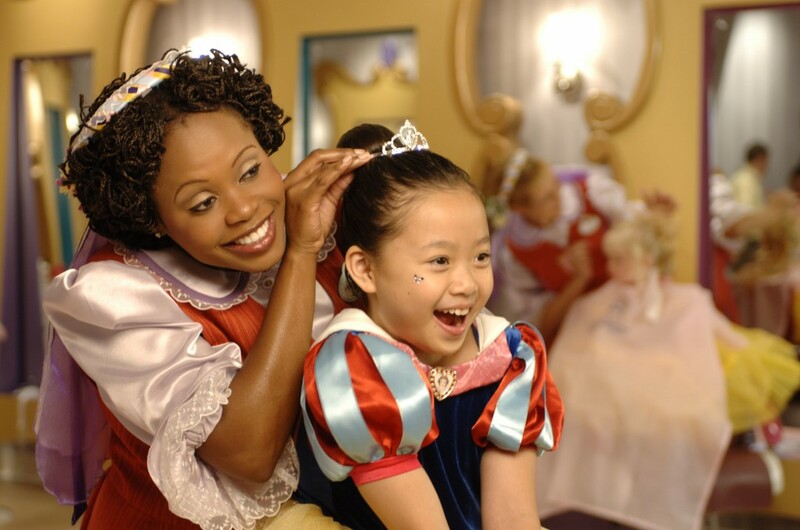 Getting a makeover at the Bibbidi Bobbidi Boutique is the dream of princesses of all ages. Have a seat with your own Fairy Godmother in training for a day of pampering! Choose a hairstyle, nail color, accessories, and your own Disney princess gown. Then capture the memory in a princess-themed photo frame! Boys can get involved with the magic too and be transformed into courageous knights. There are a variety of packages to choose from for a custom experience at the Bibbidi Bobbidi Boutique. Start with hairstyle, makeup, and a princess sash for the Coach package and add nail polish, tshirt, tutu, tote bag and more for your perfect princess pampering. Add the Imaging Package for a photo of your princess in a special photo holder. Guests can also choose the knight package for hairstyling with gel, a mighty sword and shield, and confetti! There are a few things to know before your makeover extraordinaire. The Bibbidi Bobbidi Boutique is very popular so it is recommended to make an appointment. MickeyTravels can book your appointment with a Fairy Godmother-in-training! Keep in mind that your transformation will take between 30 minutes to one hour and guests must be between 3 and 12 years of age and accompanied by an adult. Princesses may choose the costume of Ariel, Snow White, Aurora, Belle, Jasmine, Cinderella, Tinker Bell, Tiana, Rapunzel, or Merida. Remember to bring your own brush or comb and make sure hair is freshly washed and nails are clean of polish. The boutique is open from 9:30 – 6:00 PM seven days a week. The Bibbidi Bobbidi Boutique is sure to make the Disney experience fabulous for your little princess! Contact MickeyTravels today to learn more about the Bibbidi Bobbidi Boutique and how we can plan this special service for you and your little ones! www.mickeytravels.com or 1-888-812-8750. For more on the Bibbidi Bobbidi Boutique visit Bibbidi Bobbidi Boutique…for Boys and The Benefit of Disney Gift Cards.